Happy 1st Birthday East End Pioneer! One year ago, I posted the very first item on East End Pioneer. When I devised this blog, I thought that I would be lucky if my family and a handful of friends subscribed, but to my great surprise, lots of people like to read about the "other Danforth". THANK YOU, dear readers! You inspire me to be a better writer and to actually write about things that are relevant to our neighbourhood. Another thing that I wanted to mention is that by writing this blog, I discovered that Danforth East does truly rock. I know that may not be the most literary of descriptions, but it's true. From vibrant restaurants to new business owners taking a leap of faith on our strip to a wide network of creative dreamers and visionaries, there is a golden energy that exists between Greenwood and Westlake. We are all part of the vanguard in a new era on Danforth East, an era that promises a future of community building and prosperity, whether that be material or spiritual. And aren't we lucky! My lofty goals for year two include more photos, more gossip and more interviews with interesting people, including some candidates for city councillor and two guys who make musical instruments from cigar boxes. Stay tuned for more fun and adventure with East End Pioneer and Happy Trails!! Much to my dismay, my usual Saturday morning destination Three's Company Two has changed their hours. Since we're up early with junior pioneer, on weekends we sweeten the sting of no sleep-in's by heading out somewhere for bagels and coffee. This weekend, we discovered that they won't open now on Saturday's until 9 a.m. Unfortunately, it was only 7:45. With junior pioneer screaming "muffin, muffin" over and over again, we needed to find somewhere to eat and find it fast. A friend had mentioned the One cafe over at Donlands (adjacent to The Only) as a great place for coffee and we decided to check it out. Bingo! They were open and there was a plethora of comfy seating options, including shabby chic armchairs and a retro couch that the little one clambered all over. Check mark on the delicious muffins and check mark on the fast, friendly service. It's a little outside of the Danforth East zone, but definitely worth the trip. At some point, I'll have to actually sit down for brunch at the Only, since it comes highly recommended! I was invited to help out at the Danforth Mosaic BIA Spring Cleanup on Saturday and I'm so glad that I said yes. The event was such a success and it was so great to see our community out on the streets, cleaning up our neighbourhood. This wasn't the only cleanup - all along the strip, from Broadview to Danforth Village, people were out picking up trash, painting and cleaning up graffiti. What a sight for sore eyes! The event at Coxwell parkette ended with free hotdogs and juice - cooked up by our boys in blue who were also out helping clean-up the hood. All in all, I'd say there were probably about 30 bags of garbage collected from one or two blocks east and west of Coxwell. A small step towards giving the 'hood a fresh face for spring! Once upon a time, there was a bus station on the north east corner of Coxwell and Danforth, a department store at Woodbine and a Danforth Ave. streetcar. Once upon a time, our neighbourhood was genteel, and stylish women glided down the wide boulevards of Danforth East doing shopping and running errands. How life has changed here. Art of the Danforth, a week long public art walk between Greenwood and Woodbine, re-images parts of our fading facade with an art installation displaying pieces from both Toronto artists and the collective conscious of community members exploring who we are, where we came from and what our community looks like now. Organizer Cindy Rozeboom says: "This is going to be a great way to celebrate our neighbourhood and help build community pride" and I agree. The art walk kicks off this Friday. Check out www.artofthedanforth.com for more info. If you've got little ones, head over to East Lynn park on Sunday for the DECA Make A Joyful Noise Family Parade at 11:00 a.m. (also part of Art of the Danforth). Check out DECA Diaries for more info. Pioneer readers may recall from previous musings that my life on Danforth East should be subtitled "This Old House". A common refrain from many of you I'm sure, who have embraced the challenge of a century old home. While it drives DH a little crazy, yours truly loves to find weekend projects so in the spirit of spring, this past weekend Pioneer tackled some hefty power tools. Our backyard had a makeover last summer - ok, it was more like reconstructive surgery - but the rear fence/trellis structure was essentially just a decaying causeway for wayward raccoons, so down it came. In the process of building the most beautiful trellis in the world - yes, I can now use "nailing strip" and "mitre saw" in the same sentence - I discovered a local gem! Home Depot is great for many things, but if you're looking for customer service, Danforth Lumber on Dawes is a great alternative if you want that "local hardware" store feel. DH likes their bulk bin section - if you're in the mood for steel that is. Buying nails in bulk is kind of retro cool. And before I had even really finished scooping, the guy behind the counter had already calculated the cost on a half pound of 3" nails. Essentially, instead of perusing long aisles of lumber put on display by marketing geniuses, you put your order in at the counter, then head out to the yard and the guys get it for you. They'll even put it in your car for you! A lot of my posts on this site have to do with food, which is funny because I don't eat out very often (house poor, anyone?? ), although I still cling to the experience as a last vestige of being a D.I.N.K. - when I could squander a C-note on dinner and drinks without a care in the world. I'm now at desperation levels. 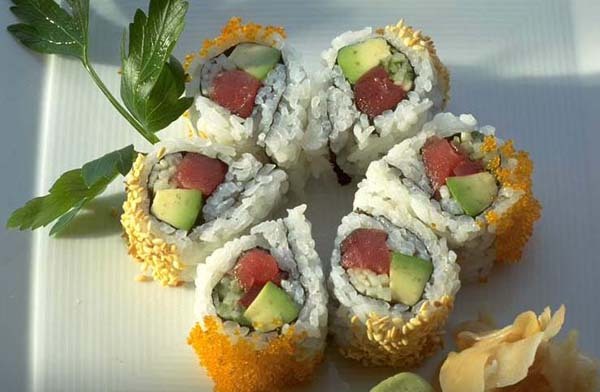 Where can a girl get great SUSHI this side of Greenwood? I've been ordering from Aji Sai at Jones, but last night DH noted that the size of the rolls keep getting smaller and smaller every time we order. The quality of the fish is excellent, but the serving is a fraction of what my personal fave (Sushi Inn) serves. And it took over an hour to get our food. Our monthly sushi takeout ritual needs a Danforth East injection! Anyone have any suggestions? 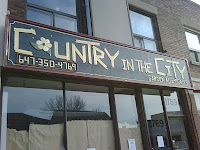 While many are bemoaning the loss of Small World Cafe at Danforth and Woodmount, there is still reason to dawdle on said block, if only to check out Country In The City - the new gardening and outdoor store that opened last week at 1769 Danforth Ave. The balmy weather has me planning a front yard facelift, so I stopped by to check it out on Monday. While I wasn't totally partial to the wood carvings, or the bohemouth lawn furnishings straight from Lord of the Rings, I was happy to see a great selection of seeds for both flowers and veggies. Had I ever wanted to start a garden (ha! I couldn't even keep bamboo alive! ), the store stocks everything I might need to be a healthy horticulturalist. What did catch my eye was the cutest, on trend, wire mesh animal sculptures that are definitely meant for indoors, not out. At 19.99, a great find for a bookshelf or mantle! Speaking of great bargains: don't forget Earl Beatty's Bargain Basement Sale coming up on April 17th from 9:00 a.m. to 1 p.m. 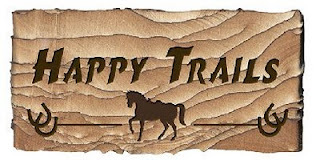 Check it out here: http://earlbeatty.blogspot.com/.